EBC vs. Hawk: what's the best brake pad? Considering skimping on your next set of replacement pads? The money you save now could compound into a crazy repair bill if your front bumper ends up kissing the rear of the sedan that stopped short to avoid squishing a squirrel. But, a high price for new brake pads and brake rotors doesn't necessarily mean better stopping power. One trip to the dealership for a brake job will prove that point in an expensive instant although you can score an electrifying set of performance stoppers at a price that won't leave you in the poor house by going with Hawk or EBC. Both manufacturers craft brakes that'll stop you on a dime, yet their prices leave plenty of change in your pocket. So, now you have to ask yourself one question: which should you get. In this age-old debate, we can't really give you a definitive answer. We can, however, present the facts and let you decide. European-engineered EBC brakes don’t play by the old brake rules. Instead, EBC has looked for every possible opportunity to reinvent the way people come to a commanding halt. Unlike some brake-builders who only craft pads or rotors, EBC makes it all. So, when you pair a set of EBC brake pads with EBC brake rotors, you know that the two will play well together. Don't worry just yet because that doesn’t mean you need to upgrade with both EBC rotors and pads at the same time. These performance brakes are custom sized to directly replace your failing or flimsy OEM pads and discs—no cutting, no welding and no blow-torches needed here. One thing to keep in mind when scouting out the perfect set of EBC brakes for your ride is that they come in a range of strengths to handle everything from everyday commutes to heart-pounding track runs. And, the last thing you want to do is put race-ready pads onto a daily driver. Here’s a quick breakdown of EBC’s lineup. EBC Ultimax Pads: Ultimax pads are the ideal choice for daily drivers. Though built with a solid bite, they’re not as aggressive as other EBC pads. EBC Green Stuff Pads: Green Stuff pads are EBC’s most popular sport pads, and they’re perfect when you want more spirited response from your brake pedal. EBC Red Stuff Pads: A step up from the Green are EBC’s Red Stuff pads, which are formulated to handle rides with 200+ horsepower or hefty weight, like trucks and SUVs. EBC Yellow Stuff Pads: Yellow Stuff pads are the right choice for high-speed rides that drive both street and strip. 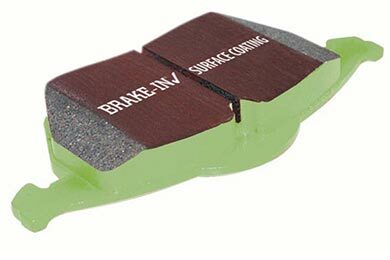 Hawk PC Brake Pads: Also known as Hawk Performance Ceramic Brake Pads, the PC pads are performance OEM replacements designed to give you better bite than stock pads. Hawk HPS Brake Pads: Short for High-Performance Street, HPS pads are the perfect choice for drivers who demand a more commanding response from their brakes. 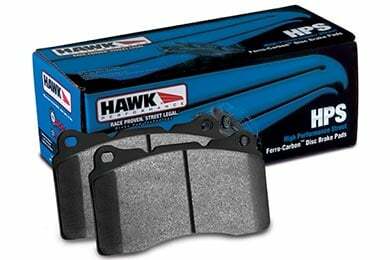 Hawk LTS Brake Pads: "LTS" stands for "Light Truck & SUV", and these pads live up to their name. Not only are they stronger than OEM brakes to keep your heavier rig in check, but they also make light towing safer. Hawk SD Pads: Short for "Superduty", SD pads are the toughest, most hair-on-the-chest pads in Hawk’s lineup. Only add these pads if you plan on doing some serious towing or hauling with a payload full of gravel. So, What Brake Pad is Right for You? You can sift through a Hawk LTS Brake pads review or two, then read an EBC brake rotor review, and you’ll quickly learn that both brake companies have happy customers. Which, then, is the right one for you? If you add either type, you’ll surely notice an immediate improvement over the pads already on your ride. And, isn’t that what’s really important? You can also read brake pads reviews from our customers to find out more information. I installed EBC Sport Rotors and Green pads. They bite really well, paired with the DBA slotted rotors I purchased. Unfortunately, I returned the EBC because I had concerns with the slots extending all the way to the rim of the disc. But EBC discs look very good and the price was the lowest at AutoAnything. The pads are great. I actually placed them on my front wheels and left the Axiss Ultimates on my rears, just to see which one had lower dust. No comparison. The Axiss, as great as they are, are terrible with brake dust. I would drive for 15 minutes and my rims would be covered. I can go well over a week with the Hawk pads and my wheels stay clean. Stopping power is great as well. I will be replacing my rear ones shortly. Reference # 766-176-483 © 2000-2019 AutoAnything, Inc.